In the ever-expanding world of disc options, new releases seem unending and trying all these new discs has become more a job than a joy. Replacing discs in your bag with new releases that are the same or very similar can be counterproductive to both your game and your wallet. With that in mind, we’ve spent the last several months narrowing the choices down from all the discs released to the public in 2018 to the best of the batch. 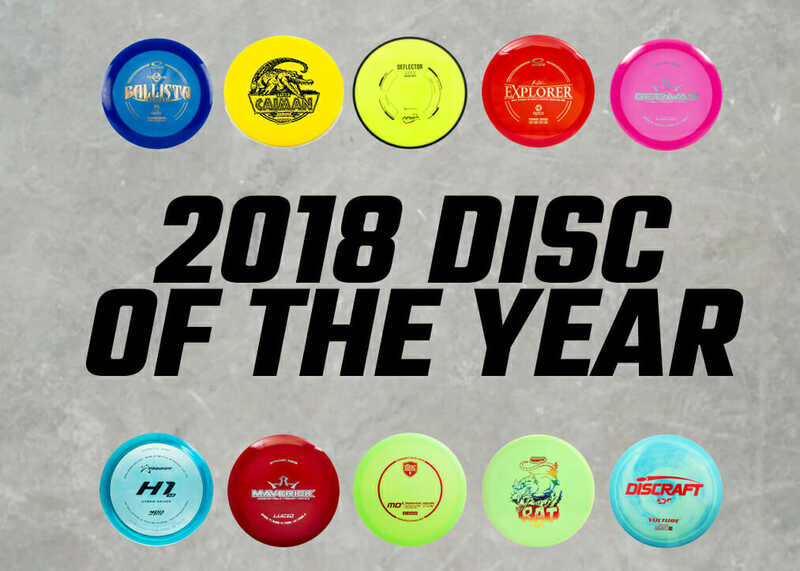 After sifting through reams of research on sales, flight charts, throws, reviews, and top pro recommendations, here are the top 10 nominees for Ultiworld’s 2018 Disc of the Year. You help decide the winner. From Latitude 64: Ballista Pro is the big brother of the Ballista, with added stability for more experienced players. It is the perfect solution if you are looking for a distance driver that can navigate through tight fairways. With great combination of speed, stability, and glide, it is the perfect tool for all kinds of distance shots. From Innova: Drawing inspiration from the Gator, the Caiman muscles its way into Innova’s mid-range lineup with a strong fade and minimal glide — the Caiman thrives in a headwind. The microbead gives the rim a smooth feel, perfect for power forehand throws. From MVP: The highly anticipated overstable midrange has arrived, the Deflector! After one of our most rigorous development processes, the Deflector is here to combat headwinds and produce powerful overstable flights in all conditions. The Deflector answers the call of many fans looking for a slower speed disc with powerful overstability. On an anhyzer release the Deflector will fight out of its turn and flatten out to fade. On a hyzer line the disc will follow a smooth fade with a pronounced stable finish. High power forehand and backhand players will find a midrange that they can unleash on and have the confidence of a predictable finishing fade. With a comfortable rim size, overstability, and smooth flight lines, the Deflector is going to find a spot in players bags for sure. From Dynamic Discs: While it shares the feel and glide of an Escape, the Getaway boasts a more predictably overstable flight with moderate fade. When straighter flights with a subtle fade are a must, trust the Getaway. From Prodigy: What separates the H1 V2 from the original H1 is an update to the rim depth, which has been reduced slightly for an easier grip. In addition, the modified outside rim produces a consistent yet faster flight with more glide. By increasing the speed and glide from the original H1, the H1 V2 offers more distance without losing dependability and it’s overstable finish. From Dynamic Discs: The Maverick can fit in nearly every player’s bag. The Maverick’s smaller rim offers controllable fairway speed and straighter flights for slower arms with trustworthy anhyzers and slow turns for experienced players. The Maverick shines in the woods with low ceilings and tunnel shots. Versatility and workable speed allow the Maverick to steal throws from even the most established bags. From Discmania: The MD5 is our most overstable midrange designed to give the trustworthy stable fade that players are looking for. Great for powerful hyzer lines, dependable flicks, and designed for optimal flight. This midrange has a beaded, low profile shape that allows it to feel comfortable in the hand and release smooth on every throw. The convex lower wing provides a surprising amount of glide for such an overstable disc, allowing the MD5 to fade further than other mid-ranges in its class. From Discraft: The Vulture is described as a well-seasoned Predator, with less overstability and more glide. The Vulture is predictable in wind and a great long range placement driver. Pros will appreciate the shot shaping ability of this driver while less experienced players will find a consistent, predictable flight. From Infinite: The Pharaoh is the quintessential distance driver, built for a high-speed release and maximum distance. The fade is not overpowering, making this a distance driver that will work wonders even for intermediate players. Throw the Pharaoh off the tee when you need to cover as much territory as possible. Rule your local disc golf course with the Pharaoh! From Reptilian: The Gila was designed to be a perfect compliment to a Roc. I have always been a huge fan of the Rocs flight but often wanted something noticeably faster & more OS. Utilizing a big bead, convex wing & flat top, the Gila is the ultimate power mid-range. They have zero turn, a reliable bite & substantial glide. Perfect for someone who needs more distance or lower lines out of their mids. Reptilian Disc Golf has always known that there are quintessential molds in disc golf. Instead of trying to recreate these discs, we sought to create pairings to them. Comments on "Vote: 2018 Disc Release Of The Year"